False information and fake news captured the headlines in 2018. The report published in April by Open Society revealed that media literacy is quite low in Turkey and the society is vulnerable to fake news. According to the report of Reuters Institute for the Study of Journalism published in June, people who reported that they are exposed to fake news the most was from Turkey which made the country the leader among 37 countries. One of the world’s most popular digital dictionaries, Dictionary.com chose “misinformation” as the word of the year in November. We published an insight report a year after the beginning of our publishing life, October 2016 by using the data we obtained and by referring our observations. The report titled “What do we doubt on the web” indicated the news categories questioned by the internet users in Turkey the most, how often the notices are sent to teyit in times of crisis and which channels are used to send the notices to teyit. We would like to share our new insights about 2018 in this article. The first insight report covered the period between October 26, 2016 and October 1, 2017. This report has been prepared by analyzing the data from October 1, 2017 to December 31, 2018. In the first period, 7.628 notices were sent for 3,820 unique cases whereas this figure rose in the second period and 11,518 notices were made for 4,835 unique cases. That is to say, the average daily notices sent with the request for fact-checking increased by 12.67 percent compared to the last period. 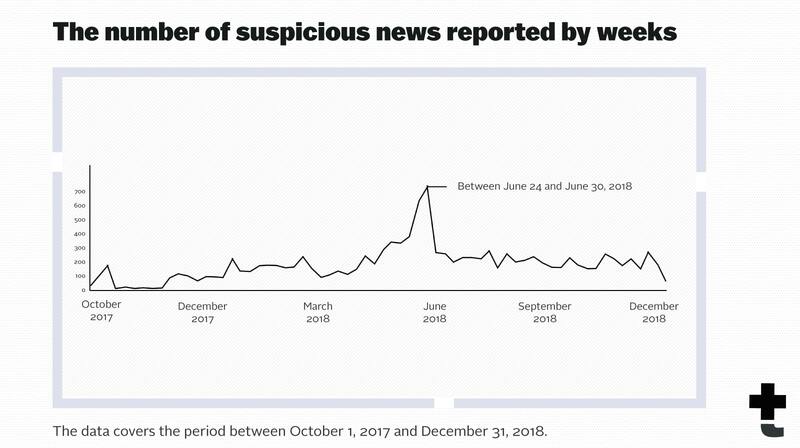 Similar to the previous report, the subject of the mostly-reported suspicious news is politics. Political issues made up 56 percent of 11,518 notices sent in our second year. This ratio corresponded to 51 percent in our first insight report. Other mostly-reported suspicious notices which come after politics were about history, health, economy, and environment. 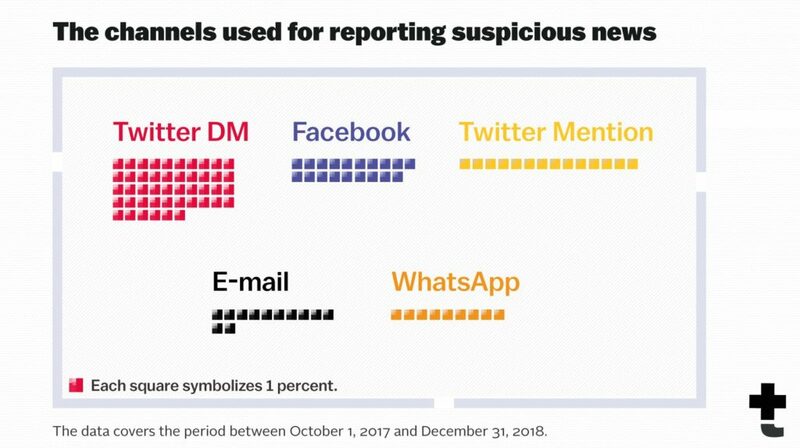 Mostly, Twitter was used to report the suspicious news. In this respect, 46 percent of 11,518 suspicious information was sent by using direct message feature on Twitter. WhatsApp was the least frequently-used channel. The notices of suspicious news reported via email went up by 5 percent. The ratio of email in all notices corresponded to 12 percent. Besides, Facebook followed Twitter as the most preferred-channel. In particular, the ratio of the users who reported suspicious news with mention feature of Twitter declined. 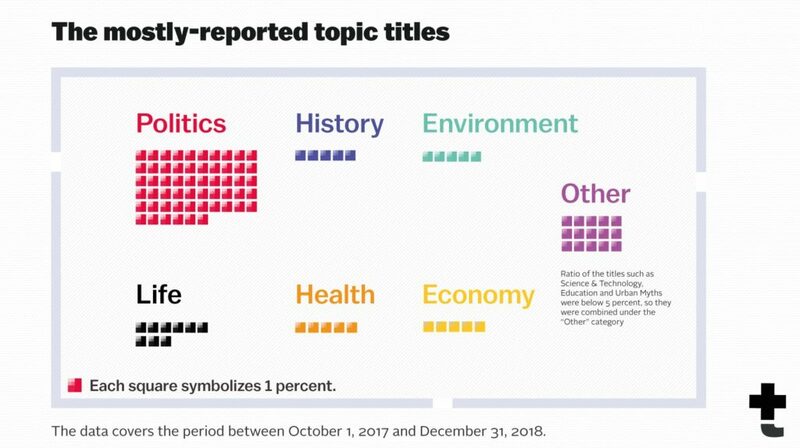 Digital news report of Reuters which analyzed 37 countries indicates that the individuals who worry about having problems with public authorities in case of expressing own political view in digital media are mostly from Turkey. In other words, there may be a close correlation between the above-mentioned result of Reuters report and the users’ preference of close platforms for reporting suspicious news. The influence of teyit on social media rose remarkably. This effect has been observed mostly on Twitter since October 1, 2017. Over 150,000 Twitter users began to follow teyit in this 15-month period. Instagram profile of teyit which was opened just in October 2018 acquired 15,000 followers. Furthermore, the broadcast of teyit on YouTube started in the last of December and brought 2,500 subscribers in such a short time. Let’s review the detailed work of teyit team with the data gathered in the last 15 months. Users reported a total of 11,518 suspicious news for 4,835 unique cases. We prepared analyses for 10 percent of these claims and shared them with our audience. However, 55 percent of the claims were not published due to insufficient data, unreliable evidence, being inappropriate for the methodology of teyit or that any different evidence could not be found from the news sites. On the other hand, 32 percent of the suspicious news was included in pending cases, since they could not meet the criteria of significance, urgency, and prevalence. The users sent us 7,628 suspicious news for a total of 3,830 cases in our first period (from October 26, 2016 to October 1, 2017). Of these cases, 16.12 percent were finalized. Compared to the first period, this rate in the second period seems to fall. The number of finalized claims both in the first and second periods is very close to each other. Nevertheless, the decrease in the finalization rate in the last period can be grounded on several reasons. First, the number of suspicious news rose. Although the users sent us more notices in the second period, the work capacity of teyit did not change. That is to say, teyit could not expand its team to respond to all claims in a short time. Secondly, users began to send contents without accurate data or with the data which cannot be fact-checked, more frequently as teyit becomes known by more people. For example, the users question even a tweet sent from the official account of the Ministry of Health, or they ask several claims for which fact-checking is quite difficult (e.g. Mevlana is a Mongolian spy), more often. The finalization rate declined because of these primary reasons. 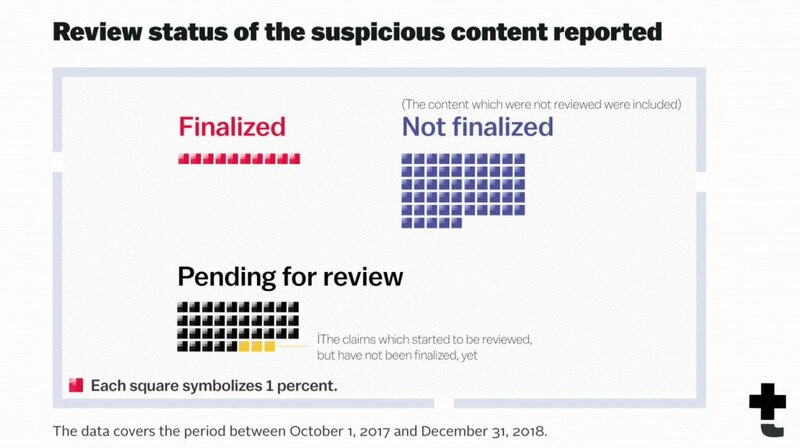 Our insight report published in 2017 involved the following categories: “Not reviewed, finalized, not finalized and archived.” However, the methodology and case analysis procedures of teyit changed since then. We began to obtain qualified data by using a program named Dubito for our editorial works. For this reason, the above figures should be explained clearly. The finalized analyzes indicate the notices which were reviewed and brought to a conclusion by the editors of teyit. “Not finalized” category contains the claims for which the editors of teyit could not gather sufficient data or which have unreliable evidence. The claims in “Not reviewed” category were not subject to review due to not complying with the methodology and principles of teyit. The claims pending for review are the notices which could not meet the prioritization criteria but are kept for review in future. The greatest interest was shown to teyit which started its publishing life with the aim of verifying the suspicious information in times of crisis when substantial social issues remained on the agenda. 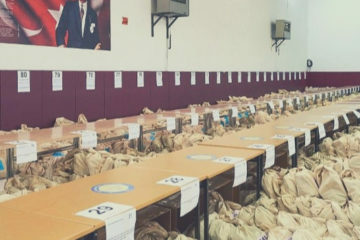 The users consulted teyit more frequently especially during the military operation in Afrin and the presidential elections on June 24, 2018. The average daily number of suspicious news sent to us – which is normally 25 – increased to 44 during the election period. Namely, this figure rose by about 75 percent. 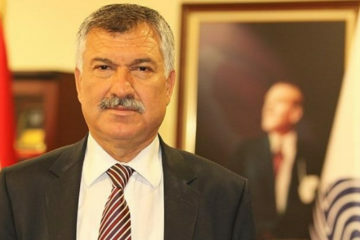 The average number of messages per case which were sent to teyit from October 2017 to the beginning of 2019 corresponded to 2.38. Similarly, it went up during crisis periods. Several suspicious information was reported to teyit approximately 100 times. 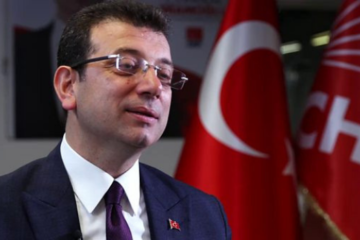 Suspicious news about the claim related to “top secret document” showing that the coup attempt on July 15, 2016 was planned by the government before was reported to teyit 138 times. However, this claim could not be finalized because of the implicit and unreliable evidence and inadequate sources. Furthermore, users sent 106 notices regarding the photo with which it is claimed that the Prime Ministers of Germany and the United Kingdom and the CIA Director were together in their youth. We published an analysis about this photo. Although we could not finalize it, numerous possibilities were evaluated in this analysis. On the other hand, the other claims mentioned in the figure were sent to us 91, 59 and 57 times, respectively. 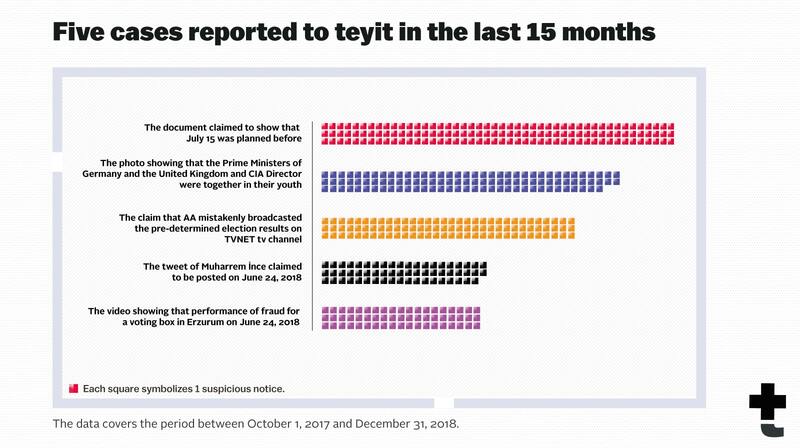 teyit started to scrutinize the suspicious information sent via the platform of Facebook after it became the partner of Facebook’s fact-checking program in May 2018. We aim to slow down the circulation of fake news on Facebook by publishing analyzes on the suspicious information which we detect in the platform. Teyit was discussed in several media outlets and it was mentioned in academic studies as well. A graduate study of Murat Uluk regarding the new media and teyit was published. Moreover, the works of teyit were referred in six different academic studies. 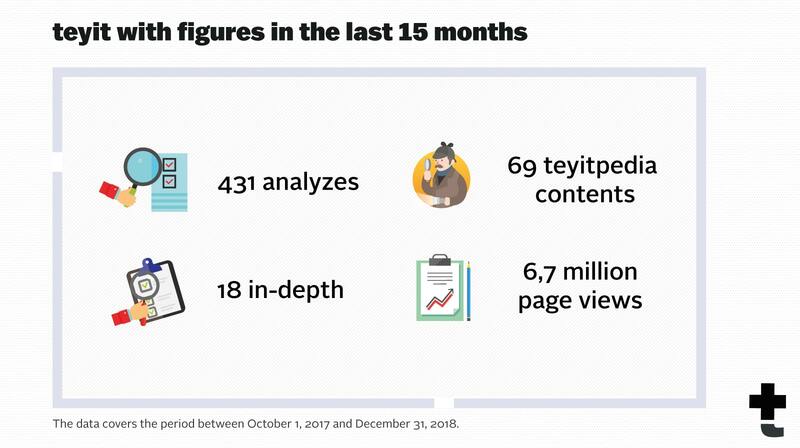 Our analyses and #teyitpedia contents were shared by various media institutions between October 2017 and December 2018. The contents from teyit were mentioned in the echo chambers of several sites 614 times within the last 15 months. Besides, 434 contents touched on teyit and its works. Teyit was discussed in TV programs as well. Thanks to the people who can reach different groups in society, including politicians, journalists, and various specialists, the message of teyit were delivered successfully. How was 2018? What is expected in 2019? 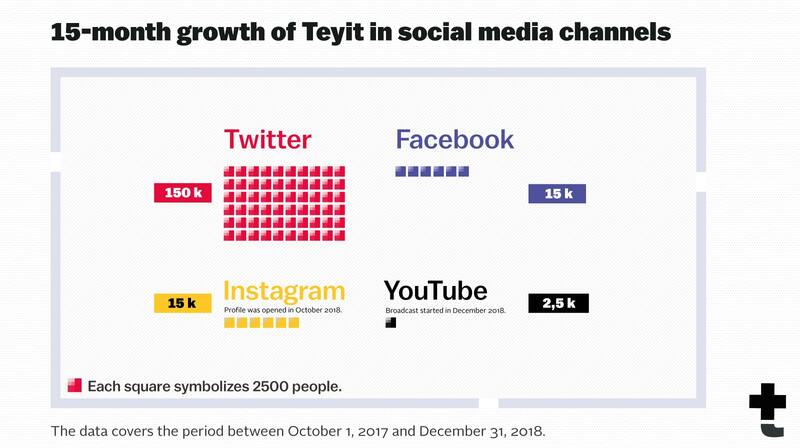 Teyit reached larger masses and various echo chambers in 2018, considering the overall data. Users asked for true information more often particularly in times of crisis. This means that we have attained one of our foundational goals. Nevertheless, we have a long way to go. Further data about the false information ecosystem in Turkey is required. We will focus on the researches and technology-oriented studies to map the sources of false information, where they get into circulation and the motivation of sharing false information. We would like to raise the awareness of the issue by using the visual media more efficiently. 2018 was a pretty critical year for us. We reached most of our objectives. We conducted research to understand the influence of polarization on media, the usage habits of the news consumers and the processes related to the role of news portals in the spread of false information. We will announce the outcomes of this research soon. We were just four people at the beginning of 2018. Later, we became 11 people by expanding our team. We updated teyit.link which we developed to prevent the loss of the links on the internet and to ensure their archiving. The Dubito tool which we use often was upgraded. Moreover, we established Editor’s Desk to show the claims reviewed by us to the followers of teyit based on our transparency principle. We provided information about media literacy to many people during the panels and training sessions which we attended. In 2019, our objective is to raise the number of these training sessions, generate more training materials in the field of new media literacy and offer training sessions to larger groups. In 2018, we gave speeches in 13 panels. We participated in three events as a trainee. Thanks to such events, we reached a total of 2,500 people. We gave 15 interviews and were hosted by six podcasts/radio programs. Lastly, we attended 15 events as participants. We published 431 analyzes, 69 teyitpedia articles, 19 insight articles and 18 file contents between October 1, 2017 and December 31, 2018. The number of page views on our website rose by 14 percent compared to the past period and approached to 7 million. We became active on Instagram and YouTube in 2018. We began to give weight to visual content. 2019 will be a year in which teyit will be renewed especially visually and start to use different communication tools effectively.